GRAB A COFFEE. TAKE A SURVEY. CHANGE THE WORLD. M A K I N G A D I F F E R E N C E I S E A S Y. Summer has sprung in this selfie provided by Blanket the Cat. Spring has Sprung at Iowa Artisans Gallery! Handmade and Local Art by over 250 artists! hood just turned a corner and entered the twilight zone. And if one is to succeed and not lose a child to the dark, because that’s what if feels like at times, a parent must learn to adapt and find new ways to communicate and engage with their tween that they think they can no longer relate to or recognize. Managing and circumnavigating through these tween years will be a test of your love, patience, and ability to forgive and move forward. Hell, at times I even wished my gifts had come with gift receipts. I know what I just said may have sounded insensitive, but there is no need To judge my transparency. I have come to understand that no matter how tough raising children is or even may still get, I would adopt again in a heartbeat because just one of the positives from this whole experience outweighs all the negatives combines. Moments of rage, confusion, misunderstanding and the occasional questioning of self is entirely acceptable. As humans, how are we to grow and learn beyond our capabilities if we are not pushed by others. In mid May Cole and Parker will be turning 13 their teen years will add to the complexity their journey, and I can only pray that I can be with them as they push my emotions to where all I understand that works is love, forgiveness, and perseverance. Magazine has decided that it is not within its mission to be a lead organizer of this event or any event of this type. At this point, no organization or group has offered to take over the responsibilities of organizing such an event. The event had an incredible organic groundswell of interest, and many commented it was time for Coralville to have its celebration of LGBTQ Pride. UAY’s 14th Annual Festival of Flowers May 23, 2019 According to UAY’s event Facebook page, the Festival of Flowers is a creative fundraising event that supports UAY’s outstanding work with youth and families in Johnson County and surrounding areas. Professionals, amateurs, and youth are invited to submit entries of floral art, fresh flower arrangements, and container gardens which are displayed, judged and auctioned off. If anyone is interested in becoming the official organizer of the event, please email info@goguidemagazine.com. There are some things in place that you may like to access. This year’s entries will be inspired by the theme of “Coexisting,” an idea borrowed from the downtown Iowa City Mural Project created by Sayuri Sasaki Hemann GoGuide Magazine is proud to spon- and UAY Youth this past summer. sor as many events as possible including Mission Creek Festival in 2019 The Festival of Flowers event ofand Iowa City Pride in past years. fers wine, hors d’oeuvres, music and GoGuide has also sponsored sever- a silent auction between 5:30-7pm. al One Iowa events and many more. GoGuide will continue to sponsor as A live auction featuring award-winning many non-profit events as possible. floral designs and other high-end packages begins at 7 pm. All proceeds benThe original event was scheduled to efit youth and families served by UAY. place Sunday, September 1, 2019, at Coralville Center for Performing Arts. h t t p s : / / w w w. u n i t e d a c t i o n f o r y outh.org/ for more information. All 1200 tickets were sold one month GBTQ Youth Center Presents “Born in advance of the 10th annual gala. this way: 2019 LGBTQ+ Prom The Center provides a safe and One Iowa started its annual Gala Cel- confidential environment for ebration tradition in 2010 to com- LGBTQ youth, families and allies. memorate Varnum v. Brien, the momentous Iowa Supreme Court case Programs at the Center are diverse and making Iowa the third in the na- include support groups, unique art oftion to embrace marriage equality. ferings, mentoring program, Pride Café, community service, health initiative Since then, LGBTQ Iowans and al- classes, parent workshops, financial litlies have come together each year eracy, tutoring, and career exploration. to celebrate and honor the LGBTQ advocates working to preserve and The Center is located at The Esadvance equality for LGBTQ Io- tle Center, 1030 5th Avenue SE. wans. This year marks ten years since that momentous decision. Get dresses up and join us for this free event! Inclusive of allies and LGBTQ+ One Iowa Executive Director Dan- Community Members RSVP to Lori Amiel Hoffman-Zinnel said, “Coming pey at Lampey@tanagerplace.org Thank together as a community to honor you to the following sponsors who have our successes, celebrate one anoth- made this event possible: Toyota Financial, er, and enjoy each other’s company Go Daddy, Giving Tree Theatre, Fox News. is truly an inspiring experience. Selling out over one month in advance The event is April 20, 2019, from and hitting capacity for the ballroom 7:00 - 11:00 pm. The event is FREE. is unprecedented for this event.” For more information visThe event is Friday, April 12 at it https://www.tanagerplace.org. the Community Choice Credit Union Convention Center. By Julia Freeman & Tim Nedoba Editor’s note: this is first in a multipart series. and possibly get a meal. This meant finding a “friend” to take him home for the night. This was, of course, very dangerous and often the night’s outcome wasn’t what he wanted or expected. As a result, he was forced to “sleep around.” Often spending each night with a different person. His lack of education did hinder him in discovery about gay culture, which he regrets having to learn later on. Of course, there were always the bathhouses, but they required money. At age 24 he was shocked to learn that he was HIV positive. In 1995 at a routine doctors appointment a liver test was needed before he could start on an acne medication. Instead of learning whether or not he could start taking Accutane he instead learned that he had the virus that caused AIDS. He was HIV positive. This was still a death sentence in the mid-1990s. “I was scared, and I didn’t know where to turn,” he said. rience shame and embarrassment about their living circumstances that prevent them from asking for help directly from loved ones; therefore, a novel support system is formed from community resources. There are community resources available for persons seeking support services such as employment, housing, and mental health recovery. Much of the regional resources are divvied for adults, especially veterans, with few for youth. Many of these shelters or programs are faithbased, seem too much like charity to those receiving support, and lack critical elements as outlined in part one of this feature. In Linn County, Willis Dady Homeless Services provides emergency shelter, while Waypoint is the central intake hub of resources and has an associated refuge. son. Notably, the subject of part one of this series faced a history which took a toll on his psyche and mental wellbeing. Within Johnson County, beyond the counseling departments of educational institutions for students, organizations such as UAY provide counseling for young (12-23) people and Crisis Center of Johnson County also help with furnishing and connecting people with mental health assistance. They each also have housing and social service case management branches. This comprehensive, all under one roof structure helps in connecting people without adequate transportation or resources to be assisted. Foundation 2 offers individual and group/family counseling to youth shelter occupants. They also serve all of Linn County in providing mental health services, including those in crises. GoGuide Election Guide: The 2020 Iowa Caucuses GoGuide goes one-on-one with 2020 Presidential candidate Marianne Williamson Editors note - This Q&A is second in a multipart series with 2020 Presidential candidates leading up to the Iowa Caucuses. date, it has changed me as a citizen of this country. It is so important to be on the ground and to see the genuine fears, frustrations, and aspirations of those in this beautiful community. GG: Do you plan to actively seek the LGBTQ vote in Iowa in preparation for the Caucus? MW: I plan to not only seek but to earn support from the LGBTQ community throughout this nation actively. I learned a great deal when I sat down with Nate and his team at Iowa Safe Schools about the struggles Iowan LGBTQ students face every day and will continue this dialogue with them and other groups hopefully into the White House. favor with because it serves me from time to time. This is a community to which I have been loyal for my entire career. My proposals when it comes to the issues that relate most closely to this community are too lengthy to summarize - I ask that you, please go to my website: https://www.marianne2020.com/issues/lgbtq-rights, for more. GG: An important issue for the LGBTQ community is health care. How is your health care plan better than the other Democratic proposals? shift to a genuine health care system, that would involve attention to environmental, agricultural, chemical and nutritional factors which America’s current corporate-dominated system of governance would presumably resist. I believe that if America is to deal with our serious issues involving chronic disease and obesity, we must look deeply at the causes of disease and not simply their treatment. For example, the Environmental Protection Agency needs to have its power restored as protector of our environment and thus our health. Until America comes to terms with how much we have acquiesced to the many unhealthy practices that should be considered unlawful -- but which are currently allowed to increase corporate profits -- we will continue to have a less-than-meaningful discussion of how as a society we provide health care. GG: Another important issue is gender identity. Is someone’s birth gender identity his or her permanent legal gender in your opinion? MW: Of course not. GG: What else would you like GoGuide reader know about your candidacy for President? kstore in Iowa City. Photo courtesy the campaign. The Clean Air Act and Clean Water Act must be restored in full, and bans on dangerous pesticides once again vigorously established and enforced. Genetically engineered food should be labeled. The Food and Drug Administration needs to have its power restored so that it can once again guard the American people from toxic substances that should not be on our shelves. And our children’s food, particularly school lunches, should be far more filled with healthy ingredients. MW: All I would add at this point is, I ask this community not to be a single-issue voting community. Yes, 100%, demand that the people you support to support you. But I say this to every community - we are not a country of individual concerns - we are a nation of universal concerns. There is so much work to be done, and we have to it altogether. And thank you, from the bottom of my heart, for your prayers, your donations, and your love. Together, we can transform America into what it is truly meant to be. More about Marianne Williamson can be found at https://www.marianne2020.com/my-story. Upcoming Iowa campaign events are available online at GoGuideMagazine.com. received HPV vaccine. A small proportion of respondents (3.3%) had been refused HPV vaccine by a health care provider when they brought it up. â&#x20AC;&#x153;Indeed, the latest summary of state cancer epidemiology data noted rising levels of HPV-related Discussion section of paper cancersâ&#x20AC;? Results section of paper - Examining the sub-set of respondents younger than age 40, less than half (41.8%) had received any HPV vaccination. Compared to ciswomen, cismen had 78% lower odds of HPV vaccination but there was no difference for transgender/genderqueer individuals. Examining sexual orientation differences, bisexual/pansexual respondents had over four-times higher odds of HPV vaccination and queer/ other individuals had two-times higher odds of HPV vaccination compared to gay/lesbian respondent. Among protective behaviors, we are encouraged to find the high HPV vaccination completion rate but also note considerable room for improvement in HPV vaccine uptake. Less than half of participants who were plausibly eligible for HPV vaccine had received it. HPV vaccination is a key cancer prevention strategy and is emerging as a priority in Iowa. Indeed, the latest summary of state cancer epidemiology data noted rising levels of HPV-related cancers. Only a small minority of our survey participants were refused HPV vaccine when they brought it up with a health care provider; however, a majority indicated that neither they nor their provider initiated a discussion. We need your help to preserve and advance equality for LGBTQ Iowans. Make a tax-deductible gift today at oneiowa.org/give. convinced this night will never end the sun will never rise. We have Inside Corridor Theater and the distinct pleasure to work with some old friends and a few new ones. By Matthew Brewbaker, Theater Arts Director Jessica Wilson and Gavin Conkling are great actors I’ve had the pleasure Welcome current and future fans to both direct and act with several of local theater, spring brings a wide times, and you do not want to miss variety of local events, from more their take on the fantastic language traditional to world premieres and in this play. Duane Larson, no strangeven a project very personal to me. er to Cedar Rapids and Iowa City theatergoers, anchors (quite literalI’ll start with the project that I am ly) this newscast and play bringing working on! Dreamwell Theatre will warmth, humanity, and gravitas. be presenting Tragedy: A Tragedy by Newcomers to Dreamwell, Nick Will Eno directed by myself and my Kilburg, and Brian Kreis bring talent, wife, Kris. thoughtfulness, and quite frankly, the kinds of voices that make you pay This play is an amazing absurdist attention. comedy presented as a local news While it is very early in the rehearsal process, but I couldn’t be more proud of what we are accomplishing. This is an unusual script, and if you are unfamiliar with the genius of Will Eno, this will be a great introduction. Dark and hilarious without being cruel or vulgar. This will be a great show to see in a more intimate setting. Space One in Iowa City. Check the website for more info or to buy tickets, www.dreamwell.com. theater in the area. There are even a few actors I worked with recently in Blood Wedding at ICCT. Also, Theatre Cedar Rapids will be presenting The Hunchback of Notre Dame, another musical based on a classic story. Directed by Angie Toomsen and featuring Kehry Anson Lane and Sage Spiker, this will no doubt be must-see theater. But what about the songs? From start to finish, the dozen tunes, including “Bad Luck”, “Last Lion of Albion”, By Gregg Shapiro “Gumball Blue” the Eric Bachmann duet “Sleep All Summer”, the dizzyIt’s no exaggeration to say that each ing “Pitch or Honey”, “Halls of Sarah” new Neko Case album is cause for and “My Uncle’s Navy” are nothing celebration. Known for her work as less than amazing. [The Englert resident diva with The New PornogTheatre welcomes Neko Case on raphers, Case teamed up with legendApril 29. For more info: https://enary, out singer/songwriter k.d. lang glert.org/events/.] and Laura Veirs for the exceptional 2016 case/lang/veirs album (if you haven’t heard “Atomic Numbers” and Veirs’ tribute to Judee Sill, “Song for Judee”, you don’t know what you’re missing). The fact is that Case also has one of the most acclaimed solo careers of any contemporary female singer/songwriter. Her latest album, the smoldering Hell-On (Anti-) reunites her with Inside Englert Theatre. Picture from Englert.org. lang and Veirs, as well as a mind-blowThe suitably titled Warm (dBpm), the ing assortment of first proper solo album of all original others including material by Jeff Tweedy (of Wilco regulars Kelly Hogan and Uncle Tupelo and Nora O’Connor. fame), is the kind of Additionally, Case is joined on the musical project that record by out artists Beth Ditto and will please the artBarbara Gruska, as well as Björn Yttilist’s fans, regardless ing and Peter Morén (of Peter, Björn of when they became and John fame), Robert Forster (of followers. As perThe Go-Betweens), Steve Berlin (of Los Lobos), Mark Lanegan (of Queens Continued on next page of the Stone Age), Matt Chamberlain, GoGuide Magazine | April 2019 |Page 21 and Kathryn Calder, to mention a few. sonal as it is universal, the sincerity of the 11 songs on Warm generates a welcome ardor similar to what we heard Kacey Musgraves do on her lauded Golden Hour album. Even the most removed listener can’t help but be moved by songs such as the exquisite “How Hard It Is For A Desert To Die”, “From Far Away”, “Having Been Is No Way to Be”, “I Know What It’s Like”, “How Will I Find You?” and the John Lennon-esque “Bombs Above”. Tweedy also breaks up the serious nature of the album with songs such as the subtle humor of “Don’t Forget” and storm beckoning “Let’s Go Rain.” One of the original founding members of the Australian band The Go-Betweens (“Streets of Your Town”), Robert Forster has been sporadically releasing a solo album for nearly 20 years. His latest, Inferno (Tapete) is a welcome addition to his canon. The songs nicely alternate between sunny pop numbers such as the irresistible “Inferno (Brisbane in Summer)”, “I’m Gonna Tell It” (which comes across like a long lost Velvet Underground song) and “Life Has Turned A Page” (on which you can hear Forster’s wife Karin Bäumler provided backing vocals), and mood pieces such as “I’ll Look After You”, “Crazy Jane On The Day of Judgement” and “One Bird In the Sky”. dormant. Elastic Days (Sub Pop) by legendary Dinosaur Jr. frontman J Mascis is an excellent example of this. An audible departure from Dinosaur Jr.’s trademark alternative rock crunch, the dozen songs on Elastic Days are admirably mellow and electrically charged without being washed out. Highlights include “Drop Me,” “Sometimes,” “Give It Off,” “See You At The Movies,” “Picking Out the Seeds,” the subtle twang of “I Went Dust,” and the title track. main songwriter, has continued making music since The Waitresses broke up and Got It Together (Future Fossil) is his latest. You can definitely hear traces of The Waitresses delicious wit throughout the album’s 16 songs (which includes three demo recordings). Formerly of Something Corporate and Jack’s Mannequin, Andrew McMahon has been making piano-driven pop music as Andrew McMahon in the Wilderness since 2014. The first few songs on his new album Upside Down Flowers (Fantasy/Crush) set the tone with their personal lyrics. McMahon knows firsthand about what he’s singing about on album opener “Teenage Rockstars.” Having lived in Ohio also gives him a particularly good perspective from which to write the song “Ohio.” In “Blue Vacation,” McMahon the father sings about needing “a place to raise my daughter,” perhaps on a “private island” in “Blue Vacation.” No longer a “teenage rockstar,” McMahon sings like a person with responsibilities and “mouths to feed” (“Paper Rain”). Sunlight Tonight (Normaltown/New West) is the solo debut album by Parker Gispert of Georgian band The Whigs. Except for “Is It 9?,” Sunlight Tonight is a much less raucous affair than you might expect from the front-man of The Whigs. The gorgeous “Magnolia Sunrise” even features a lovely string section. BOOKSTORE HOURS: Mon–Fri 1O am – 9 pm, Saturday 9 am – 9 pm, Sunday 1O am – 6 pm, CAFÉ: opens 9 am daily & closes w/bookstore. line is different, and streets are shifted in a way that feels same-not-same. It’s like having dinner with a relative you met once, when you were nine: as in “When Brooklyn Was Queer” by Hugh Ryan, everything and nothing is familiar. In 1883, the Brooklyn Bridge opened, making it easy for residents to reach New York City. There, male and female impersonators found work at live entertainment venues, where race mattered little; and sexes and social classes mixed freely at saloons, concert halls, dancehalls, and theatres. For African American actors, that relative permissiveness led to more acceptance and sometimes, fame. By the time Brooklyn merged with The Bronx, Queens, Manhattan, and Staten Island in January 1898, a new word had emerged. “Homosexuals” had been targeted by obscenity charges for quite some time then but, Once upon a time, Brooklyn was little though laws were created against them, they had a solid presence in more than farms and fields. mainstream society. Even so, says That’s the vista Walt Whitman saw when he stepped beyond the bound- Ryan, most people didn’t learn much about homosexuals until World War I. aries of the city where he’d been creating his Leaves of Grass. He loved the area, a love he shared with labor- And yet – people couldn’t get enough of “queer” folk, especially with cabers, prostitutes, and the rest of the aret shows, vaudeville, and “freak crime-ridden, mostly-white populashows” so wildly popular and a subtion of Brooklyn in the mid-1800s. As a gay man, Whitman would have noted upcoming changes. a fun, fascinating, all-encompassing history, “When Brooklyn Was Queer” is a nice change. 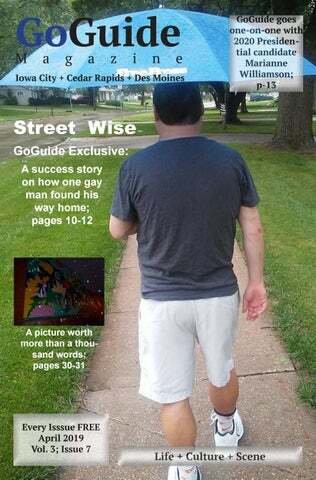 Summer of Pride GoGuide Magazine’s commemorative May/June double issue. Including a section on Best Places to Work in Iowa. 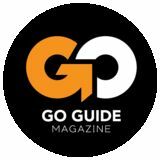 Visit GoGuideMagazine.com for more information. Erivo belted out one cover tune after another and left us all breathless! We wrapped up our trip watching the Airotic show by Les Farfadais out of Parisâ&#x20AC;Ś they performed both on stage and during one of the leading outdoor dance events as well! Be sure to check out their upcoming itineraries at www.AtlantisEvents. com. --------------------------------------About the authors: Matt Skallerud and Richard Brower enjoy eating well and traveling more! They met while they were both an active part of the IGLTA team, and are married and now live in New York City. Richardâ&#x20AC;&#x2122;s talents are finding incredible flight deals from JFK to points all over the world, as well as locating the best eateries along the way. Matt is part of Pink Banana Media, Pink Banana World, and the #ILoveGay network, and enjoys merging his personal and professional worlds along the way on these trips.